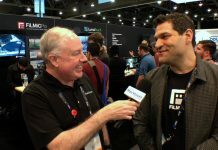 The original Padcaster was such a success that Josh Apter has launched a Kickstarter campaign to bring the same functionality to the iPad mini. The Padcaster is a metal frame with an insert that holds your iPad firmly in place, can mount it on a tripod, and is lined with threaded holes to mount other gear such as lights, mics, and more. Oh, and it comes with an adapter to mount lens that otherwise would be impossible to use with an iPad. 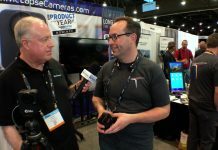 Josh discusses the iPad mini version, the new and improved version of the original Padcaster, and why they each turn the iPad into a powerful, compact video tool for the professional or amateur. Josh also discusses why the Padcaster has become popular in eduction, his experiences with the Kickstarter process, and more. After graduating from the University of Pennsylvania, Josh Apter attended NYU’s Graduate Film Program, where his film, “The 53rd Calypso,” was honored with the Martin Scorsese Award for achievement in directing. The film, which stars Edward Norton, received numerous awards for directing, editing, and cinematography at film festivals across the country. Josh has worked in all areas of filmmaking, from location sound recordist on numerous feature films, to videographer for Steven Spielberg’s Shoah Foundation, where he recorded the testimonies of over 150 Holocaust survivors. As a film editor, Josh has worked on over ten feature films including The Holy Land (winner Slamdance FF/Cavu Pictures Distributor), Kaaterskill Falls and Barbecue is a Noun (Audience Award for best Documentary at the Rome International Film Festival and the River Run Film Festival). From his love of post-production, Josh founded Manhattan Edit Workshop in 2002. MEWShop is an Apple, Avid and Adobe, Assimilaste and Autodesk Authorized Training Center offering a variety of classes in the art and technique of film editing. With clients ranging from AMC Networks, HBO, NBC and CNN, Manhattan Edit Workshop has become the premier training destination for the highest-level content creators and media professionals. On top of all that, Josh is the owner of The Padcaster, LLC. Pinnacle Studio – Corel Inc.